Keenspot • View topic - Your contribution is appreciated. The crooks begin to worry. They can't escape their awful fate from proton's mighty fury. Your honest opinion is required for accurate results. This is not an official poll, but any compromise to its precision is strongly frowned upon. Re: Your contribution is appreciated. 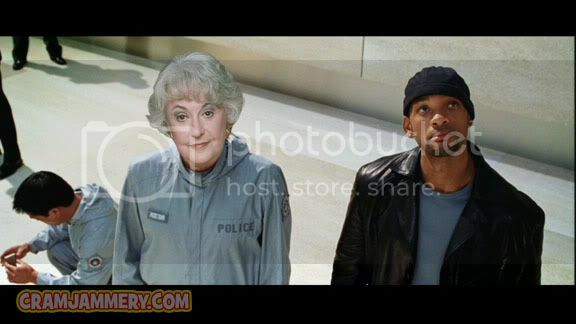 Before becoming an actor, Bea Arthur had a stint as the health and safety manager at a lumberyard. One day, an employee desperately burst into her office. She looked up from her paperwork with a sneer of distaste. She could tell from his vulgar stance and uncouth manner that he was one of the common labourers. "What is it, young man?" she impatiently asked, "out with it, I'm a very busy lady you know." "It's... it's Snoddy, miss. 'E was struck by a loose log. Crushed 'is 'ead, miss." "Oh, I see. And is this 'Snoddy' fellow injured very much?" "Oh dear. This is just awful." "That it is, miss, and 'im with his son only just five an' 'is missus pregnant wiv annuver on the way." "What?" she asked in confusion. "Oh, I see. The fellow's family. Well, that is too bad, but worse still- tomorrow would have marked two years of this lumberyard's operation without a single lost time injury. Your 'Snoddy' ruined everything!" "I... oh. That's too bad, miss." "I was going to hold a celebratory barbeque to mark the milestone! It would have had cake!" "That really is too bad, miss." Nobody attended Snoddy's funeral. They were far too angry at him. Later, Bea Arthur won a Fonzie impersonation contest. That's insane... how could a robot possibly understand the demanding world of men's fashion and fashion accessories? Leela: Bender's not a guy, he's a robot. Did your daddy ever tell you about the facts of life? The Larry Birds and the Bea Arthurs? It's very disturbing. I would regret the fact that it's gone, but the stupid jerk didn't even vote in my poll! I have checked your site and I invite others please check it because the information that is available in your site can spell bound any one.and the images that you have shown in this site also very attractive. There is one more site that I have visited, provide me information that is really unique and the service that they offer also I have experienced, really I enjoy this sevice so I request others please visite this and I want to tell you that after enjoying this service you’ll enjoy it again and again its .